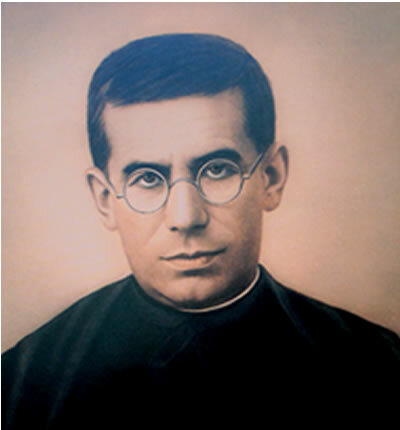 Blessed Joseph Timothy Giaccardo was the first priest of the Society of St. Paul. He was born on June 13, 1896 , at Narzole d’Alba in Italy, and at a young age, 12 years old Joseph Timothy Giaccardo had his first encounter with Father Alberione. Assisting the pastor of Giaccardo’s parish, Father Alberione heard the young boy’s first confession and was impressed by his docility, devotion to the sacraments and spirit of prayer. Aware of his desire to become a priest, in October of 1908 Father Alberione invited Joseph to accompany him to the seminary. On September 4, 1917 while still a seminarian, Giaccardo joined the Society of St. Paul and two years later, on October 19,1919 he was ordained a priest. Soon after, Giaccardo was nominated as the vice-superior and treasurer of the Pious Society of St. Paul. On January 6, 1926, Father Alberione entrusted Father Giaccardo with the task of establishing the first house of his Institute in Rome. While in Rome, Father Giaccardo mediated matter between Father Alberione and the Holy Father in the approval of his Congregation. In 1936, Father Giaccardo relocated to Alba, Italy as the Motherhouse director. Furthermore, he also dedicated himself to the spiritual, moral and cultural formation of the Sister Disciples of the Divine Master. Father Giaccardo celebrated his last Mass on the morning of January 12, 1948. During that same morning, Pius XII approved the Sister Disciples of the Divine Master, a Congregation so dear to Father Giaccardo. He had offered his life for the approval of this Congregation. Still vested in baptismal innocence, Father Giaccardo passed away on January 24, 1948. John Paul II beatified him on October 22, 1989. Most Holy Trinity, you have given Blessed Timothy Giaccardo the gift of living the heroic path of following Christ in the spirit of St. Paul the Apostle and under the gaze of Mary, Queen of Apostles. You willed to unite him with the charism of Blessed James Alberione as his first priest and most faithful disciple. And you, Blessed Timothy, unite with my prayer your powerful intercession so that the instruments of social communication may always promote what is good and help in making Jesus Master, Way, Truth and Life known, loved and followed by all. Amen.